For more information on the health consequences of eviction, see the study “Eviction’s Fallout,” co-authored by the Kinder Institute’s Rachel Kimbro. In the back of the standing-room only courtroom in northwest Harris County, a woman flips through a day-old newspaper, stopping on a story about a River Oaks home featuring Italian marble and gold-leaf glass tiles in the master bathroom. Others scan their phones or whisper to each other about the wait. The back rents owed hover around $1,000 to $1,500, going as low as $509. But it doesn’t matter how small the debt is. As soon as it’s late, a Texas landlord can choose to evict. “If you did not pay, you cannot stay,” is how Judge Goodwin, one of two Justices of the Peace in Precinct 4, puts it to the courtroom. In Houston, aside from the overworked Lone Star Legal Aid and a handful of legal clinics, renters are often on their own. With rents steadily rising in the Houston metro area, agencies that offer aid like short-term rental assistance say they’re seeing demand creep upward, even as federal funding has shifted away from homelessness prevention toward ending homelessness. It’s an approach that is seen by some as more reactive than proactive. Job loss, medical costs, even car trouble can put someone behind on rent. And once that happens, there’s little standing between them and an eviction that will have immediate and lasting negative consequences. The chaos of an eviction can send ripples through a person’s life. And because of the insidious logic of the process, it typically serves as an additional, sometimes debilitating blow amid existing hardship. “How much are you seeking in back rent?” Judge Goodwin asks each landlord, one-by-one. Available data on evictions is limited. On a recent Tuesday in this court — one of 16 JP courts across the county — the day’s docket had some 90 eviction cases. Requests to the individual courts for historical docket data went largely unanswered. One court referred the request to the county attorney, and another estimated the costs in fulfilling the request would exceed $800. Without more detailed data, it’s difficult to get a sense of the human toll of evictions in the Houston area. A 2013 survey of renters in the Houston area found that roughly 1 percent of renters had been threatened with eviction in the last three months, according to the American Housing Survey, produced by the U.S. Census Bureau. And more than 2.5 percent said it was likely they’d have to leave their home in the next two months due to eviction. When asked where they’d go, roughly a quarter, said they’d find a new home. 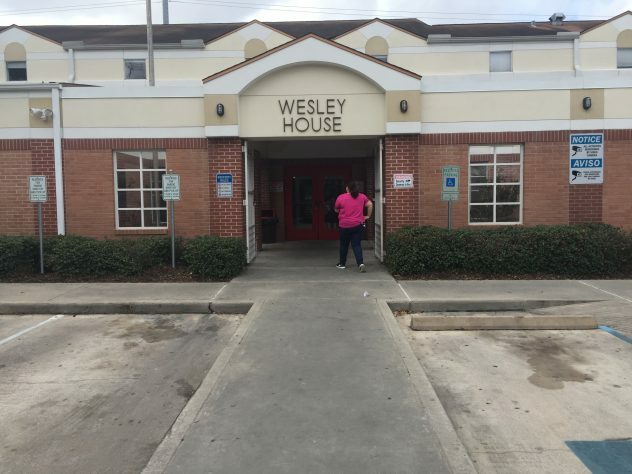 That’s wishful thinking, said Jennifer Brock, a case manager at the Wesley Community Center in the Near Northside neighborhood just outside downtown Houston. She helps people who have received an eviction notice with short-term rental assistance for up to three months, depending on their case. 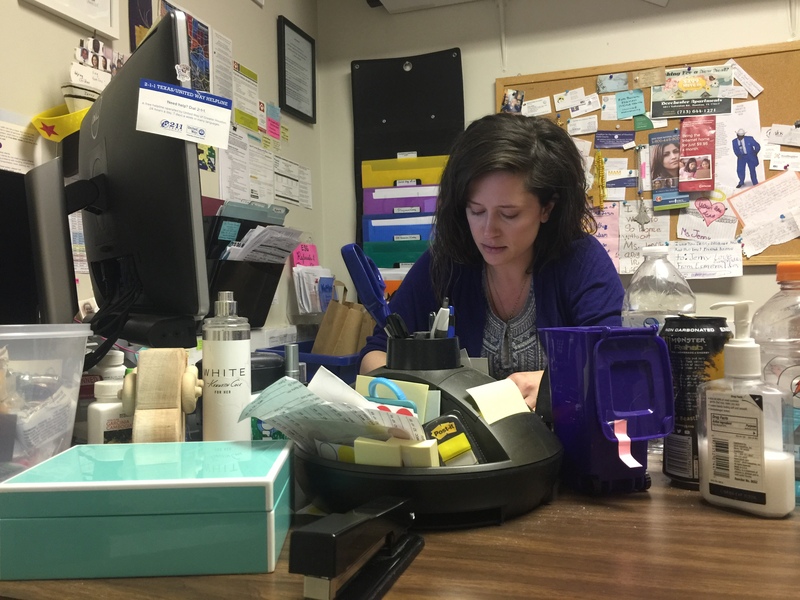 Jennifer Brock, a case manager at the Wesley Community Center in the Near Northside, works to connect people to short-term rental assistance. Photo by Leah Binkovitz/Kinder Institute. While it’s “nice in theory” to imagine you’d simply find a new apartment, she said, “that’s a lot harder than it seems. Having a single eviction on your record limits you so dramatically.” That’s because landlords often require references from a potential tenant’s previous residence. She keeps a list of places that work with her organization on a case-by-case basis, mostly apartment complexes well outside Houston’s inner core that she said are as quick to accept someone with an eviction as they are to evict them after the first day of late rent. When possible, she said, private landlords are the best. Cindy is certain that, without Brock’s help, she’d be living in her car. Again. She met Brock in September 2016. Cindy, whose name has been changed to protect her identity, had been ill for months at that point. Complications from a pregnancy meant she couldn’t work for roughly two months. She lost her job and the unborn children. Triplets. And then she got the eviction notice. She had been struggling to get on her feet for years, and this threatened to undo all that work. When Cindy thinks of home, it’s always the same place: the three-bedroom house off Mesa Drive in northeast Houston. She lived in other homes growing up, but that was the one where she and her mother stayed after her seven older siblings had moved out and gone to college. There, it was just Cindy and her mom. The neighborhood is full of brick, mostly one-story homes. Two-car garages. Sidewalks. Trees. “I had a great childhood,” she said. Her mother was a master barber and her father worked for the city of Houston. They never wanted for anything, she remembered. It started with her job. Cindy has a master’s degree from Texas Southern University and had worked in education her whole career. Her mother even briefly ran a day care out of their home when she was younger. At the time her mother got sick, Cindy was working as an education consultant, marketing curricula and training teachers. But she quit to take care of her mom, who soon died. After that, Cindy said, everything just “slipped.” She didn’t have any money saved. She had a young daughter. Her ex-husband had died just two months before her mother. She felt alone. So Cindy did a short sale and sold the house she inherited from her mom. Initially, she stayed with siblings: First a sister, until one of her nephew’s caught shingles, then a brother at his senior citizen home, hiding whenever staff came around. In 2014, she had another baby, a girl. But she was sick a lot in the first few months, and Cindy missed work when she couldn’t take her to daycare. Her daughter’s father was not helpful, she said. That summer, during one of the staff sweeps through her brother’s senior housing complex, Cindy and her daughters had to sleep in her Honda Civic for four days in a gas station parking lot to avoid getting caught. She’d run the air conditioning as long as she could, the humid Houston air cloaking her car. And then they’d watch Youtube videos on her cell phone until her daughters fell asleep, first the oldest and then the baby. In August 2015, she was able to move into her own apartment. She was there for a little over a year. But then she got pregnant and the bleeding started. There are many ways an eviction can play out, but it starts with a “notice to vacate” the landlord delivers to the tenant, whether for late or nonpayment, or a violation of the lease. The standard is three days to leave, unless the lease says otherwise. If the tenant departs, then that’s the end. But they can stay, forcing the landlord to file the eviction in court. This additional step is thought to help prevent landlords from abusing their power. The process requires a landlord to present the case at the eviction hearing, which usually happens somewhere around a week or two after the suit is filed. Eviction court is an informal affair, with the process largely dependent on the judge running it. Most tenants don’t show up. Landlords win those cases by default. But occasionally tenants and landlords will work something out at the bench, with the encouragement of the judge. “Some judges will let them go on, and some will cut them off, because it really doesn’t matter.” Medical emergencies, job losses, traffic accidents — none of it matters to the final decision judges can make in eviction court if a landlord is unwilling to negotiate. “I don’t envy those guys,” said Teas. Even if the case is dismissed because the landlord worked something out with the tenant, it can still show up on the tenant’s rental history. If the judgment goes against the tenant, there’s a five-day window to appeal, which would send the case up to the county level. Otherwise, the constable will arrive and supervise the move out. That’s the typical process, but there are variations and abuses. Landlords, can, for example, change the locks on a property. But the tenant is entitled to a new set of keys during the eviction process, something not all tenants know. Personal motivations can work their way into the case, said Brock, even though there are some protections for tenants against retaliation for reporting code violations, for example. And when threatened with something like a visit from the constable, many people believe the landlord’s threats, without knowing how the process should work. Then there are the misconceptions and gray areas that often work against the tenant. “There are a lot of urban myths,” said Brock, “these widespread ideas people have that just aren’t true, like being able to withhold rent because the landlord isn’t making repairs.” Or tenants could have informal agreements with landlords to do the repair work themselves in exchange for a discount on rent, only to be given an eviction notice. “He said we’re even,” was what one tenant being evicted told Goodwin. Brock is able to start working with clients as soon as they receive that first eviction order from their landlords, that way she can guarantee there’s a definite need, a requirement of her funding. Of course, that leaves a tight window, roughly a month, for her to intervene. And she’s seen clients evicted before she was able to actually meet with them. Recently, she’s noticed more landlords who are familiar with how short-term rental assistance works and who, she said, are comfortable working with tenants once they know they have some assistance coming. “They want to be paid,” she said. For a landlord, it’s sometimes more desirable to work with a tenant than go through with the eviction. “First, they’re going to lose all the money the current tenant owes, they’re going to have to pay to go to court, there’s the whole eviction process and then there’s the re-letting time,” she explained. For a private landlord who may only own a property or two, that can be a huge loss. It’s also no coincidence that more landlords seem to be familiar with the rental assistance process because demand for such programs has increased. The upturn in need in the past year mirrors the period immediately after the recession, said Sharon Zachary, who heads the Alliance of Community Assistance Ministries, which includes Wesley Community Center and serves a five-county area. The oil slump and flooding, as well as rising rents across the metro area, combined to increase the strain on families as well as the number of utility bill payments and rental assistance cases handled by the ministries in her organization, according to preliminary numbers. Wesley Community Center can provide a valuable lifeline for those in need. All told, the city of Houston received more than $2 million in funding in 2016 in the form of federal Emergency Solutions Grants, about the same it got in 2015. Harris County, meanwhile, received an additional $1 million and change. That funding, which is distributed locally, goes toward shelters, rehousing efforts as well as homeless prevention like the work Brock does. That’s in addition to private funding as well, which can come with fewer stipulations. Recently, thanks in part to new guidelines, there’s been an increased focus on rehousing, rather than preventive measures like rental assistance. But people who work with both landlords and tenants know the often small costs that can stand between a person being housed and becoming homeless. Even when someone doesn’t end up homeless, the impact of an eviction can last for years. Looking at a national dataset, researchers found that one in two mothers who experienced eviction reported struggling with depression and they also reported more health problems in their children as well. The study, co-authored by Matthew Desmond who later published his own book on the subject, also found that eviction upsets the lives of children as well, framing eviction not only as a product but a cause of poverty as well. Cindy knows the costs. After losing her mother and having to sell their home, she said the stress just piled on top of her, taking her years to recover from. She’s still recovering. Looking ahead, she said she feels like she has what she needs to be self-sufficient. She’s found good work as a substitute teacher and is living in a one-bedroom apartment with her daughters, planning ahead for the hard summer months when she won’t be in the classroom. Her youngest daughter’s father pays child support every week. And she washed and sold some of their old clothes online. Now, she’s looking into becoming a driver with Uber. “I try to do little things to help myself out now,” she said. The apartment is one of 12 on the east side of town in a neighborhood called Cloverleaf. She’s happy with the schools but not as much with the apartment. First, she had trouble with the window unit that was supposed to heat their one-bedroom place. And the hot water heater stops working after a few minutes of warm water, so she sometimes has to heat water for her kids on the stove. Cindy now lives in Cloverleaf in the eastern part of Houston. Image via Google Streetview. Right now, they don’t go out much because Cindy said the area has a lot of prostitution and drugs. Her dream is to live in a home in Galena Park, so her daughter could stay in the same school district. This is a very interesting documentation of the impact of eviction however, it misses some critical information about the financial impact of homelessness prevention services. Memorial Assistance Ministries, MAM, has offered rent assistance since 1983. In 2006, we began to look at the outcomes of the families we have helped with both private funds (up to $240 for one month rent), 3 months of funding through STEP, a privately funded program for families with a crisis but a concrete plan to rebound and the Homeless Prevention Funds in the Emergency Solutions Grant described in the article. Our results are astonishing: 82% families assisted with the private $240 (MAM money) are in their apartments for 3 months post assistance and less than 10% return for assistance in subsequent years , 88% of the STEP families were still housed 3 months post support and 91% of the ESG families, the poorest, were still housed 3 months post support. Homeless prevention WORKS. Thank you for looking into this valuable community safety net. Thank you so much for this insightful look into the impact of eviction and the importance of prevention as a strategy to assist those facing eviction. Located in one of Texas’s most affluent counties, our eviction courts overflow daily. Our organization seeks daily to assists those under the threat and support their return to economic stability. Providing this type of awareness is critical to our success.